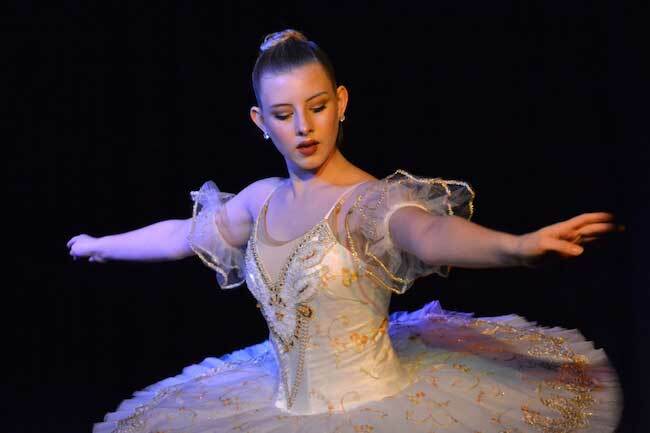 Photo by Tom Rivers: Lauren Thomas practices for her role as the Sugar Plum Princess in the Nutcracker during a show last Saturday at Gotta Dance by Miss Amy. Lauren will perform a dance this Saturday during the 8th annual Nicholas Kovaleski Hometown Christmas. ALBION – The 8th annual Nicholas Kovaleski Hometown Christmas returns Saturday for three shows by members of the Albion community. There will be singing, dancing and even comedy. The show honors the memory of Nicholas Kovaleski, who the inspired the Albion community with his valiant fight against leukemia. He died at age 15 on June 29, 2011. He was a popular student at Albion, excelling at football, swimming and tennis. Nick’s sister Michayla is among the dancers in Saturday’s shows. Nick’s younger brother Matt normally plays the drums for the Albion band and in the pit orchestra for school musicals. On Saturday he will make his debut as a soloist in singing. Other community members will perform, including High School Chorus Director Gary Simboli. Two of his students, Riley Seielstad and Kate Krieger, will sing solos. Altogether, there will be about 60 people on stage during the program. The shows are at noon, 3 p.m. and 6:30 p.m. at the Holy Family Parish Lyceum, 106 S. Main St. Coffee and desserts are served and there is a basket auction. There will likely be about 50 baskets up for bid, including jerseys from Buffalo Bills greats Jim Kelly and Andre Reed, who are both in the Pro Football Hall of Fame. There also is a 43-inch television in the auction. For information about tickets, call Gotta Dance at (585) 354-2320. Saturday is also the Hometown Holidays event in downtown Albion with events from 10 a.m. to 4 p.m. Click here for more information. 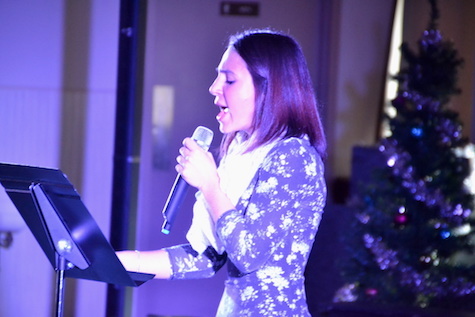 ALBION – Rose Allen sings, “Mary Did You Know,” during today’s noon show of the seventh annual Nicholas Kovaleski Hometown Christmas at the Holy Family Lyceum. 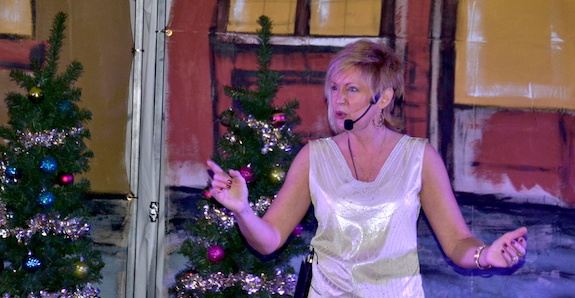 There are three shows today of Hometown Christmas, which features 19 acts, with singing, dancing and some comedy. Hometown Christmas raises money for a memorial scholarship for Nicholas Kovaleski, who fought leukemia before passing away at age 15 on June 29, 2011. He was a popular student at Albion, excelling at football, swimming and tennis. He was also an active Boy Scout. The interactive workshop is geared towards helping teens and others find purpose and direction for their lives. The Kovaleskis will be run a free workshop on Jan. 13 from 7 to 8 p.m. at the Gotta Dance Studio at 28 West Bank St., Albion. Click here for more information. 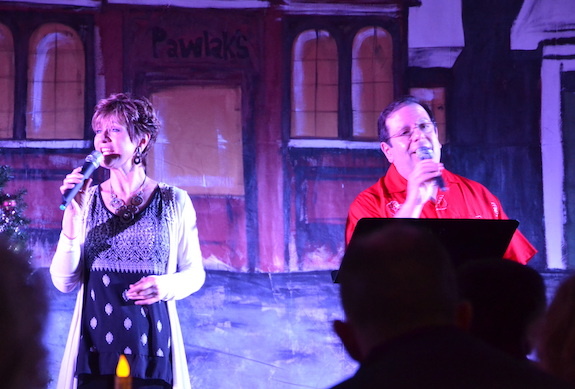 Marcy Downey and Gary Simboli sing “Happy Days” during Hometown Christmas. 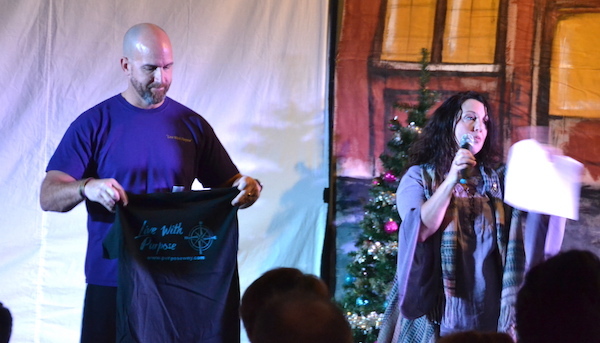 Amy Sidari, Hometown Christmas coordinator, gives an inspirational welcoming message to start the show. She is among about 50 different performers today in the Hometown Christmas shows at the Holy Family Parish Lyceum. 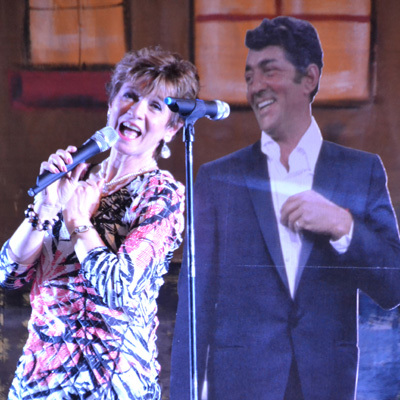 Marcy Downey sings “Baby, It’s Cold Outisde” next to a cutout of Dean Martin. There are 17 acts in the show, which is nearly two hours long. Michayla Kovaleski and her mother Kelly sing a duet, “Hallelujah (Light Has Come)” during the noon show. Hometown Christmas raises money for a memorial scholarship for Nicholas Kovaleski, who fought leukemia before passing away at age 15 on June 29, 2011. He was a popular student at Albion, excelling at football, swimming and tennis. About $10,500 in scholarships in memory of Nicholas have been awarded to graduating Albion seniors. They write essays about community service and living with a purpose. Mikayla Yaskulski, front, and Kate Krieger are part of a group that danced to the song, “Hello” by Adele. Many of the performers are dancers in the Gotta Dance by Miss Amy studio. Rose Allen sings “Amazing Grace” to the crowd at the Lyceum. Lauren Thomas dances to “Maybe I’m Amazed.” Michayla Kovaleski and Laiken Ricker also are in that group dance. 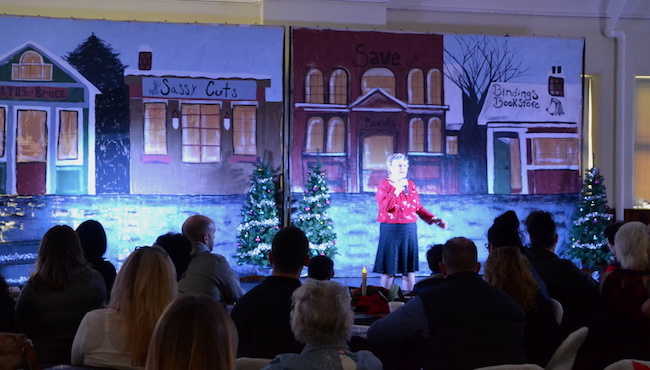 ALBION – The fellowship hall at Holy Family Parish Lyceum was transformed into a stage and performance venue on Saturday for the 5th annual Nicholas Kovaleski Hometown Christmas. About 50 performers were part of the cast for three shows. About 500 people attended the event, which is a fund-raiser for a memorial scholarship in honor of Nicholas Kovaleski. His sister Michayla (top photo) performs as the Sugar Plum in a dance from The Nutcracker. Nicholas’s mother Kelly Kovaleski shared reflections about her son, who died from leukemia at age 15 on June 29, 2011. He was a popular student at Albion, excelling at football, swimming and tennis. He would have graduated last June. She said her son wanted to join the military. Marcy Downey sings “More Than Wonderful.” She also sang a duet – “How Great Thou Art” – with Joise Waverly. Rose Allen sings “A Baby Changes Everything.” Santa Claus is in the background. These dancers, including Katie Rustay at right and Michayla Kovaleski at left perform “You Wouldn’t Cry.” There were 18 differents acts for the show. ALBION – Amy Sidari, owner of Gotta Dance by Miss Amy and coordinator of the Hometown Christmas production, meets with performers and support staff on Sunday for the 5th annual Nicholas Kovaleski Hometown Christmas. About 50 performers will be on the stage for three shows on Dec. 13 at Holy Family Parish Lyceum. Some new performers for this year’s show include Josie Waverly and Rachel Curtin, the Albion Elementary School principal. Waverly for the first time will also sing publicly with Marcy Downey, an Albion native and professional singer. Hometown Christmas also serves as memorial for Nicholas Kovaleski. He inspired the Albion community with his valiant fight against leukemia. He died at age 15 on June 29, 2011. He was a popular student at Albion, excelling at football, swimming and tennis. He would have graduated last June and likely would be a college freshman. His mother Kelly and his sister Michayla will also perform during the show on Dec. 13. During his fight with leukemia, Nick urged the community to “Live with Purpose.” His classmates and the school staff and teachers continue to keep Nick’s memory and his message alive. Proceeds from the show are used for a scholarship in Nicholas Kovaleski’s name. It is given to a senior who lives with purpose. File photo – Catherine Thom and other dancers in Gotta Dance by Miss Amy perform Snowflakes, an excerpt from the Nutcracker during last year’s Hometown Christmas. The row in the back includes, from left: Laiken Ricker, Rylie Lear and Lauren Thomas. Catherine Thom and other dancers in Gotta Dance by Miss Amy perform Snowflakes, an excerpt from the Nutcracker during Saturday’s fourth annual Nicholas Kovaleski Hometown Christmas. The row in the back includes, from left: Laiken Ricker, Rylie Lear and Lauren Thomas. Marcy Downey sings “Over the Rainbow” during the Hometown Christmas show on Saturday at the Holy Family Parish Lyceum. A cast of about 50 performed songs and dances in memory of Nicholas, who died at age 15 on June 29, 2011. He was a popular student at Albion, excelling at football, swimming and tennis. He would have been a senior this year. A video at the beginning of the program featured Nick’s classmates and school staff holding signs with inspirational messages. During his fight with leukemia, Nick urged the community to “Live with Purpose.” His classmates and the school staff and teachers continue to keep Nick’s memory and his message alive. 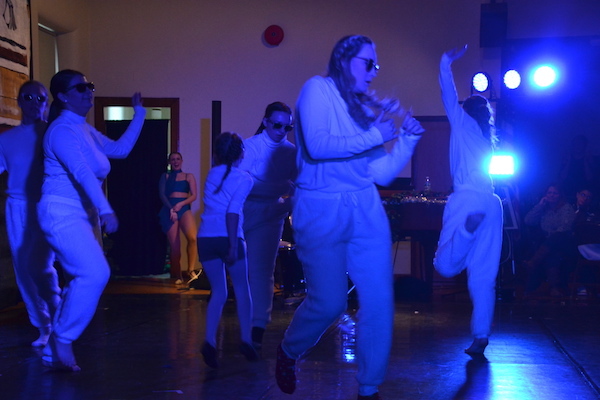 The Gotta Dance studio performed three shows on Saturday that drew more than 300 people. Proceeds are used to a fund a scholarship in Nick’s memory. So far, five scholarships have been awarded to graduating Albion students. Nick’s mother Kelly Kovaleski , left, sings “The Shape of You,” a song she used to sing with her son at bedtime. She is joined by Albion music teacher Karen Conn.
Nick’s brother Matt Kovaleski introduces his band, “The Chick Magnets,” which also includes Noah Duvall, Connor McQuillan, Nick Sacco and Bryce Pritchard. The Rev. 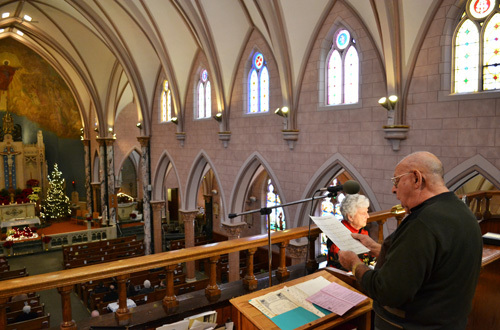 Richard Csizmar, pastor of the Holy Family Parish, shares a reflection during the one of the shows on Saturday. ALBION – More than 50 participants have been rehearsing for the fourth annual Nicholas Kovaleski Hometown Christmas. Gotta Dance by Miss Amy will perform three shows on Dec. 14 at noon, 3 p.m. and 6:30 p.m. at the Holy Family Parish Lyceum, 106 South Main St.
Amy Sidari, Gotta Dance owner and director of the show, is pictured with a group photo of last year’s cast. Nicholas Kovaleski inspired the Albion community with his valiant fight against leukemia. He died at age 15 on June 29, 2011. He was a popular student at Albion, excelling at football, swimming and tennis. He would have been a senior this year. Several of Nick’s classmates will share a presentation during the Hometown Christmas. Nick’s mother Kelly will sing a solo, “The Shape Of You,” and Nick’s sister Michayla will do a solo dance. There are 15 acts in all. Noted local musicians Marcy Downey and Gary Simboli are among the performers. 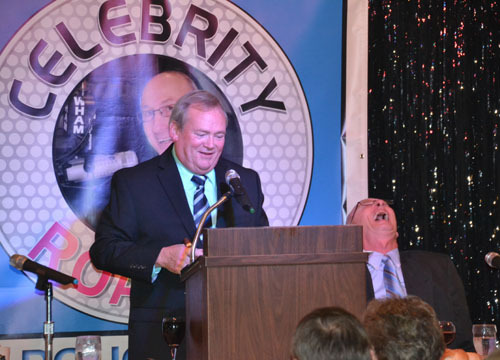 “It’s going to be a lot of fun with a lot of humor,” Sidari said. The Rev. Richard Csizmar, parish priest, will also share a reflection during the each of the shows. For more information about the show and tickets, click here. ALBION – “Mr. 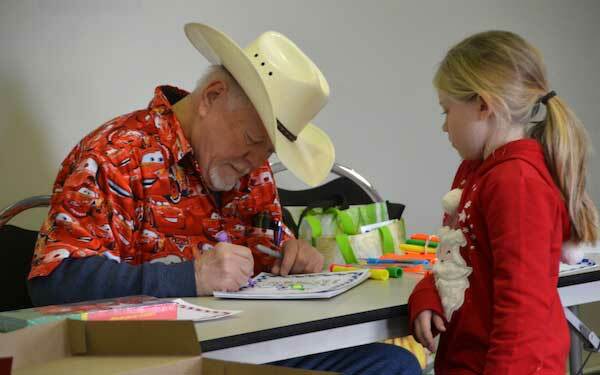 Scribbles” – Michael Sparling of Perry – was a popular person Saturday during the Hometown Holiday celebration in downtown Albion. Sparling lets kids scribble on a paper and then he adds cartoons of animals with a friendly message. He is making a picture for Carsyn Mogle, 7, of Holley at the Village Office. 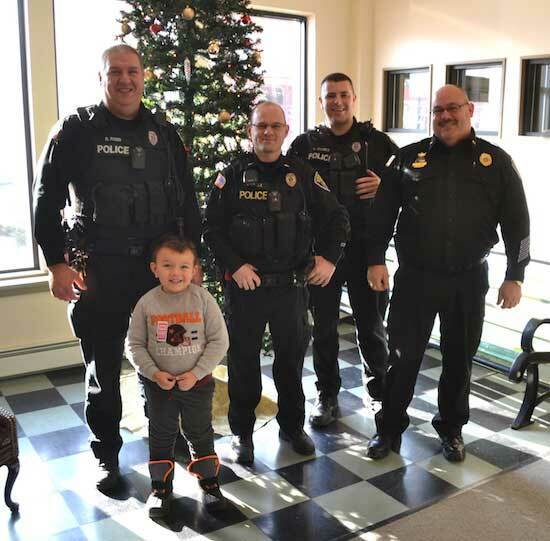 Oliver Carter, 5, Albion gets his picture taken with four members of the Albion Police Department, including from left: officer Daryl Robb, Lt. David Mogle, officer Nathaniel Staines and Police Chief Roland Nenni. 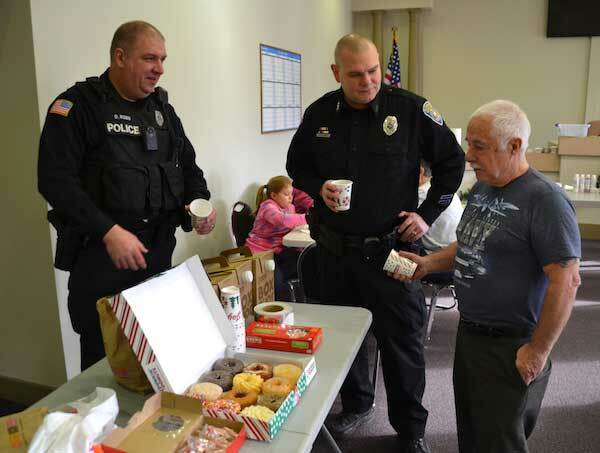 The Police Department served coffee and doughnuts in the morning and pizza for lunch. They were one of the stations at the Village Hall. 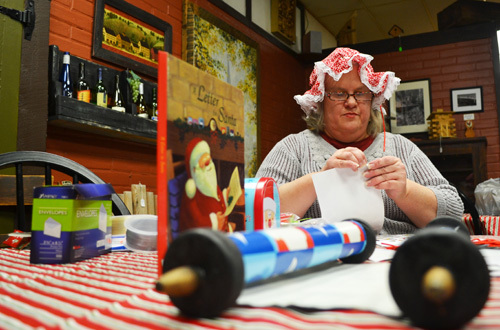 The Albion merchants Association organized the seventh annual Hometown Holiday, which included many activities at downtown businesses and a raffle. Al Capurso helps children with a craft. He also led the group in singing Christmas carols. 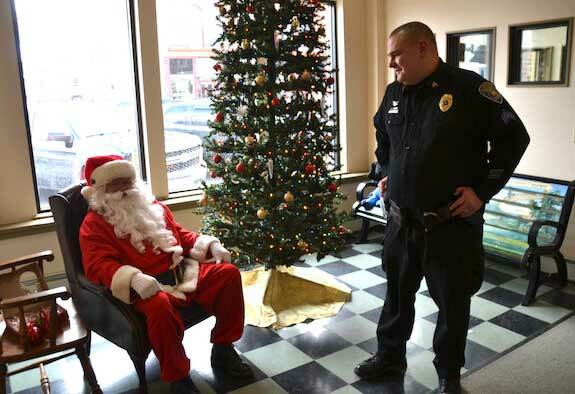 Albion police officer Karol Hughes chats with Santa at the Village Office. 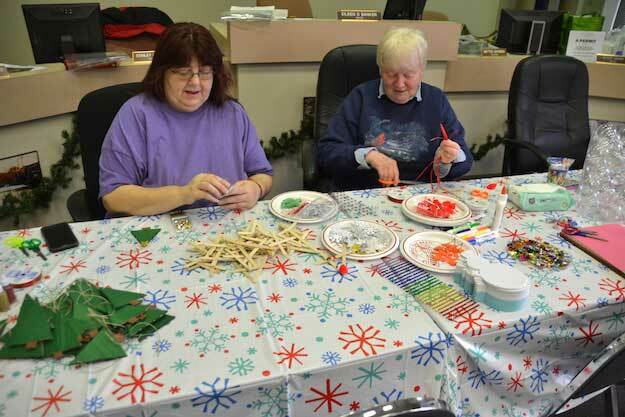 ALBION – The Albion Merchants Association is hosting its seventh annual Hometown Holiday in the downtown today from 10 a.m. to 4 p.m.
Debbie Grimm, left, and Grace Kent are getting crafts ready for children in the Village Office at 35-37 East Bank St. The Village Office also will have Mr. Scribbles, coffee with a cop and a coloring contest. There is free coffee and doughnuts this morning and free pizza at noon while supplies last at the Village Office. Other businesses are also hosting activities, including cookie decorating, a sing-a-long, letter writing to Santa, crafts with Mrs. Claus, Christmas trivia and a reindeer raffle with 28 items up for raffle. 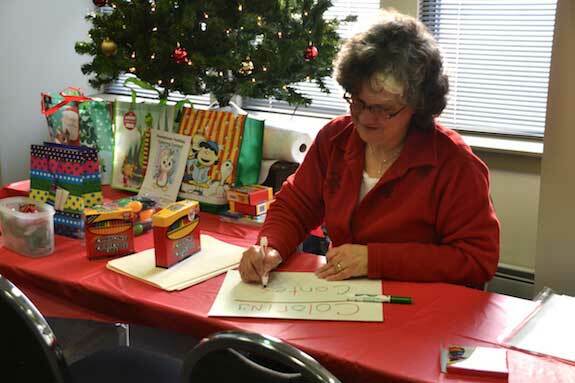 Anita Finley is ready for people to enter the coloring contests. There will be prizes for children 5 and under, ages 6 to 9, and ages 10 to 12. Finley’s husband Todd is owner of the Oak Orchard Canoe. They are members of the Albion Merchants Association. ALBION – There are many fun activities scheduled today in downtown Albion for the annual Hometown Holidays event organized by the Albion Merchants Association. New this year is “Coffee with a Cop” at the Village Office form 11 a.m. to 3 p.m. Albion police officers Daryl Robb, left, and Karol Hughes are shown chatting with Stan Farone, a village trustee. The Albion Dunkin Donuts donated the doughnuts and coffee for the event. 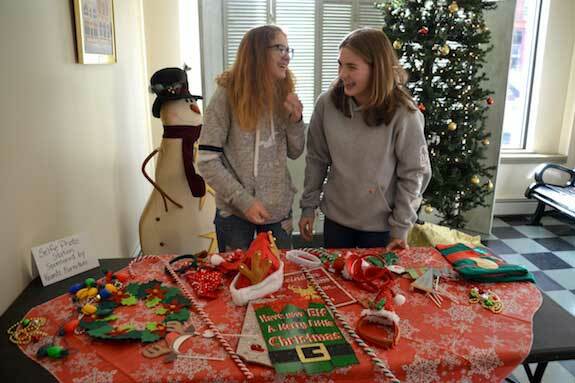 There are many activities on schedule until 4 p.m., with Santa stopping by the former Swan Library from 4:30 to 6 p.m.
Arianna McGurn, left, and her friend Logon Conlon are running the selfie photo station at the Village Office. They are both in ninth grade. Lisa Stratton, owner of the Hazy Jade Gift Shop, is hosting a wine-tasting with Midgard Winery from Corfu. 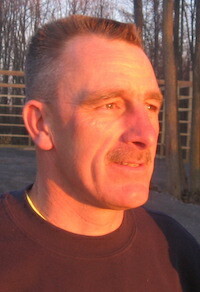 Michael Potoczak has several different wines available for tasting. Midgard will be back on March 3 for Albion’s annual wine tasting event. 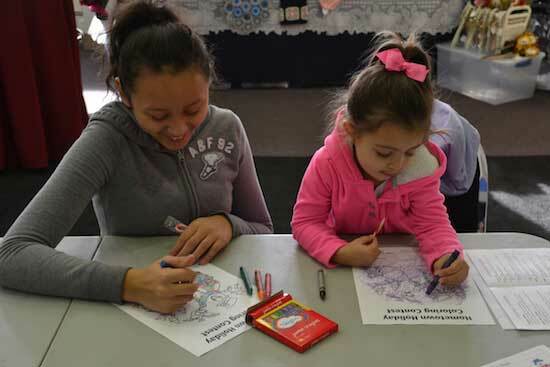 Ariana Mateo, 12, and her sister Eva Mateo color in a Christmas-themed design at one of the stations at the Village Office. Brushstrokes in Medina brought ornaments for children to paint. 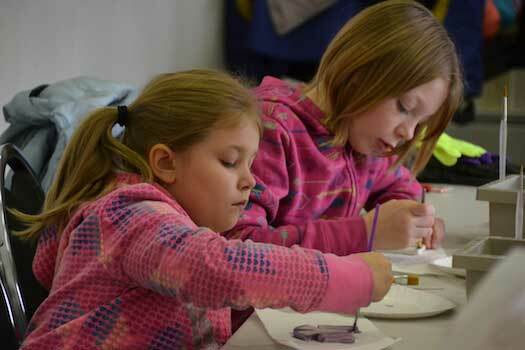 Kiri Keller, left, and Becca Lusk work on painting ornaments. File photo by Tom Rivers: Mrs. Claus is pictured here during Hometown Holiday in December 2013. She will be back at Knight’s Pride today from noon to 3 p.m.
ALBION – The Albion Merchants Association has many activities planned today for the fifth annual Hometown Holiday. Children can make ornaments (at MMIM), make reindeer dust (at Lynne Marie Hair Boutique), play holiday games, write letters to Santa and eat cookies. Mrs. Claus will be at Knight’s Pride from noon to 3 p.m. and Santa will be available to meet youngsters at the old Swan Library from 12:30 to 2 p.m. The activities are all free go from 10 a.m. to 4 p.m. (although not all locations will be participating the full six hours). Here is a list of some participants: SnL Sweet Escapes, cookie decorating; Digital Ink Arts, holiday games; Tease, cookies and hot cocoa; Xpress Fitness & tanning, reindeer raffle; Hazy Jade Gift Shop, Santa hand print art; Uptown Browsery, snowman ornament; Olde Dogge Inn, pine cone ornament; Downtown Browsery, letter to Santa; and Save-A-Lot, coloring contest. There will also be an elf hunt, where people can win a ticket for the reindeer raffle if they find an elf. The Merchants also have a 12 Days of Christmas Scavenger Hunt. Photo by Tom Rivers – Downtown Albion is decorated with banners and wreaths for the holiday season. Many of the merchants also have lighted displays in their storefront windows. ALBION – Albion business owners will host their fourth annual “Hometown Holiday” on Saturday. The event has grown with new activities including a “Where’s Rudolph” challenge. There will be a Rudolph at 19 sites and children who can find at least five will receive a goody bag. Each participating merchant will have a passport for all of the reindeer locations. Merchants will host other activities, including ornament making, letter writing to Santa, story time, coloring contest, and cookies with Mrs. Claus. 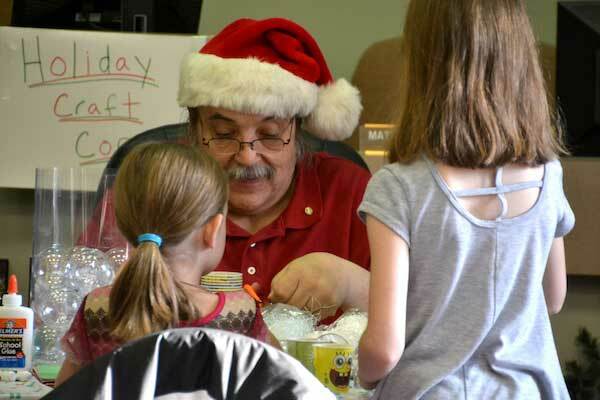 The events run from 10 a.m. to 5 p.m. with Santa at the Cobble-Ridge Co-op at 14462 Ridge Rd. from 1 to 3 p.m. The event also includes a Christmas Gift Fair with several vendors at the Pullman Memorial Church from 10 a.m. to 3 p.m.
For more information on the day, visit one of the businesses or check the Merchant’s Association Facebook page by clicking here. 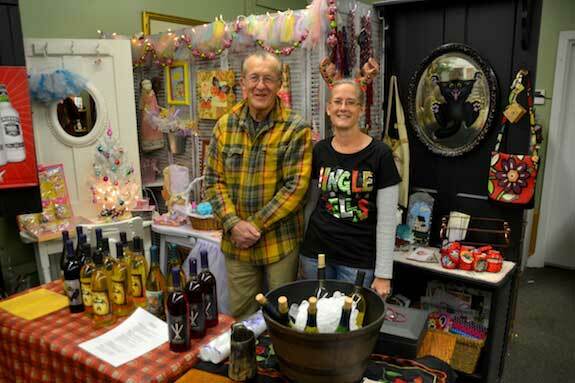 A slender Santa who resembles Jim Knight helps promote the Christmas Gift Fair last Saturday. Vendors will be back tomorrow at the church. File photos by Tom Rivers: Marcy Downey sings “Baby, It’s Cold Outside” next to a cutout of Dean Martin during last year’s Hometown Christmas. ALBION – Two events this weekend in Albion will celebrate the Christmas season and also raise funds for Albion scholarships. On Saturday, there will be three performances of Hometown Christmas at Holy Family Parish’s Lyceum on Main Street. There will be 19 acts featuring about 80 performers at shows starting at noon, 3 p.m. and 6:30 p.m. There will be singing and dancing in the 90-minute shows that raise money for scholarships in memory of Nicholas Kovaleski. “We’re blessed with a lot of people contributing time and talents to it,” said Amy Sidari, oner of Gotta Dance by Miss Amy and coordinator of Hometown Holiday. This is the seventh annual event in memory of Nicholas Kovaleski. He inspired the Albion community with his valiant fight against leukemia. He died at age 15 on June 29, 2011. The shows on Saturday feature many popular returning performers, including Marcy Downey and Josie Waverly. (Some Albion children will be on stage doing sign language while Waverly sings, “O Holy Night.”) Rachel Curtin, the elementary school principal, also will be back singing. A new performer for the Hometown Christmas will be Albion senior, Angela Tarricone, singing with chorus teacher Gary Simboli. Sidari said the 6:30 p.m. show is already sold out but some tickets remain for the 3:30 and noon shows. Call her at 354-2320 for more information. “People come out and support it year after year,” Sidari said about the turnout. Joe Sacco is shown during a Christmas Mass in 2013 with Harriette Greaser. They will both be performing on Sunday. On Sunday, there will be a 3 p.m. concert at the First Presbyterian Church, 29 East State St. Many familiar faces and a warm welcome home are on the program for “An Albion Family Christmas Concert.” The holiday event, co-sponsored by the Albion High School Alumni Foundation and Albion Courthouse Square Concert Series, will feature a mix of professional and amateur musicians, all connected to Orleans County. Proceeds benefit scholarships awarded by the Foundation. In fact, many of the performers are alumni or students at Albion High, including: longtime Albionites and Holy Family Parish musicians Joe Sacco and Harriette Greaser; mother and daughter duo Karen Conn and Shannon Vanderlann; brother and sister act Greg Martillotta and Gwen Ferchen; husband and wife Gary and Claudia Deibolt; members of the Mike and Mary Jane Grammatico family; and legendary music and drama teacher Gary Simboli, along with some of his vocal and Mike Thaine’s instrumental student ensembles. The program will be narrated by Janne Erakare and will include a visit from Cobble the Museum Mouse (representing the nearby Cobblestone Museum). The event will culminate in the annual audience singalong. Tickets are available at Bloom’s in Albion, a lily and a sparrow in Medina, Roxy’s in Batavia, or online by clicking here.